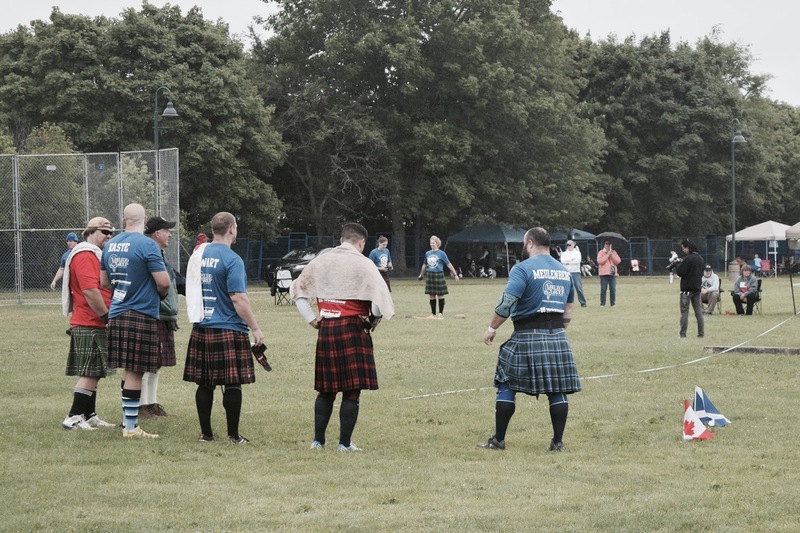 The timing of our stay in the North Shore region of Nova Scotia this summer afforded us the opportunity of attending the 153rd Antigonish Highland Games. I was elated to have the opportunity to attend the oldest, longest running Highland Games outside of Scotland. There is just something fascinating about seeing big burley guys in kilts throwing around stones and tree trunks. Oh, and surprise! There were women competitors as well - awesome! Profession Maritime Scottish Heavy Weight competitors Joe Hall, Jeff Kaste, Ryan Stewart, Jason Baines, and Robert Meulenberg in the forground. USA competitors wore blue and Canadians wore red. Some female competitors are in the background. The caber toss is a crowd favorite at the games. Here you can watch competitor Nathan Burchett's nearly perfect toss. The goal is to toss it end over end into the air and have it fall at exactly 12 o'clock from your throwing position - thus the need for the judge to follow behind the competitor. There were many other heavy events performed by skilled participants - most, if not all, were from Canada and the United States. A Junior League was also present to compete. The hope is that they will one day be professionals able to continue the tradition and quality of the games. 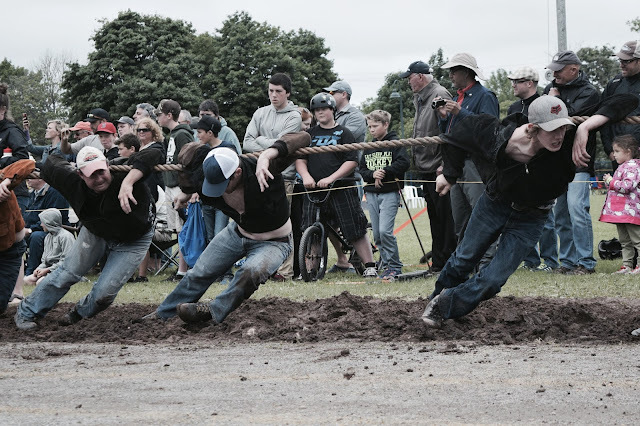 The most unexpected competition was the Tug of War events. It seems each community has their own team of strong and scrappy individuals. Each event is 15 minutes long. The most exciting moment occurs when the entire team switches their grip and turns toward the anchor man for a concerted lunge to gain ground. Sometimes it works and sometimes it doesn't. Unfortunately, during the two 15 minute events I never quite caught that moment on video, but there were other exciting moments that were. 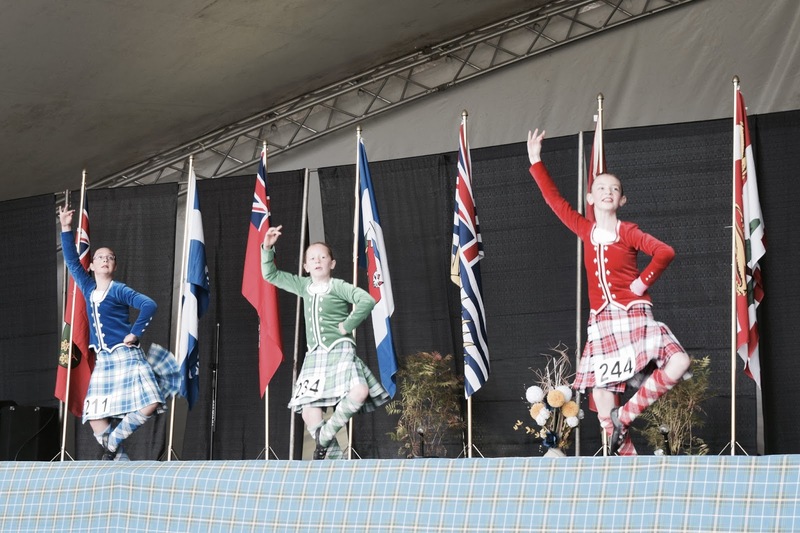 In addition to all of this, there were also musical competitions for bag pipers, pipe bands and their drummers as well as a highland dance competition all occurring simultaneously. Bagpipes and drums were heard throughout the day as bands practiced while soloists competed and vice versa and all this mingled with the music of the bagpiper playing for the dancers and the voice of the announcer for the heavy weight events. The best show was put on by the bands as they played for the judges. Note how the drummers twirl their bass beaters in the video of 78th Highlanders Halifax Citadel Pipe Band. Our family enjoyed our day experiencing all the cultural sites that the Antigonish Highland Games had to offer which included a parade through downtown. 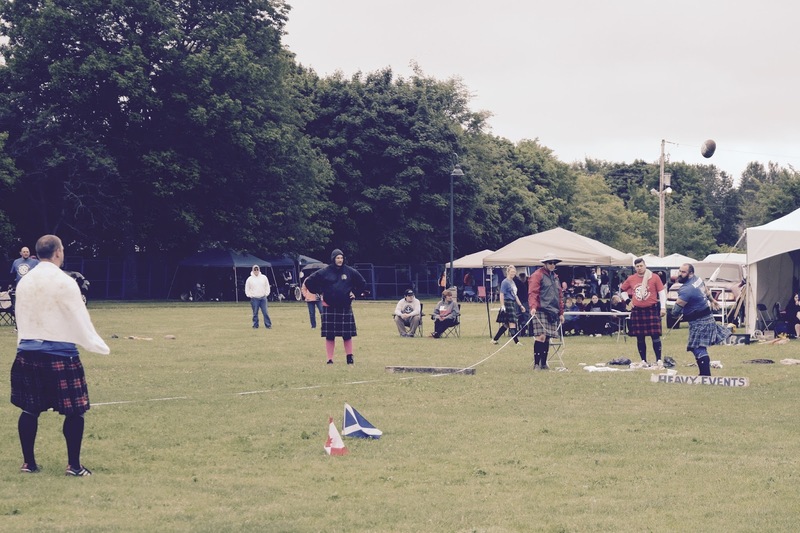 Given that it was Highland Games weekend in Antigonish, we expected huge crowds and terrible traffic. We were astonished to find things very low-key, laid-back, and no huge crowds to speak of perhaps due in part to the cooler and somewhat damp weather. Whatever the cause, it helped to make our experience at the games a very positive one. I would certainly attend again should I get the chance.